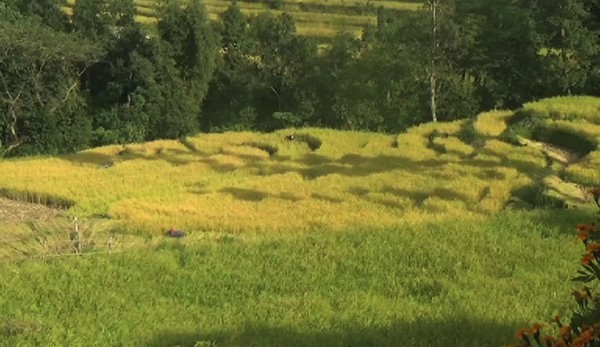 The farmers of Dophuchen Gewog in Samtse are expecting a bountiful paddy harvest this time. With timely rainfall leading to abundant irrigation water, farmers are hoping their rice yield will double too. At this time of the year, with their paddy ready for harvest, the fields around the villages in Dophuchen Gewog add to the scenic beauty of the place. Farmers are filled with joy and excitement to harvest their rice yield. “For many years, our farm yields including rice were not good. But this year even the maize yield was good,” Oma Pati Phuyel, a farmer, said. “This year we are blessed by timely rainfall during paddy cultivation time. We will be happier if rain does not intervene while we harvest the rice,” Netra Maya Acharya, another farmer, said. The rice cultivation in the gewog picked up following a drop in cardamom price in recent years. Last year, the gewog produced 684 metric tons of rice. The farmers not only grow rice for self-consumption but also for the commercial purpose. They grow three varieties of rice and a kilogram of rice is sold at about Nu 75. Farmers are expecting to make more income from the rice this year.